Looking for a secure yet compact way to store and display a lot of boards, like in your retail surf shop, surfboard workshop, or because you've got a large surfboard quiver? The Surfboard Hanger is all that and more. Primarily built with the surf shop in mind, the Surfboard Hanger can be utilized by anyone that doesn't have the ability to install traditional, mounted surf racks. With a simple horizontal mounting pole, you can hang an entire quiver of surfboards back-to-back in a compact space. It's a great way to maximize your surf shop's space to store your surfboards but also display them for your customers. 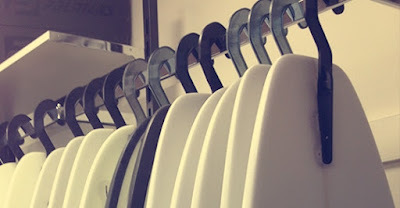 The Hanger doubles to store and display surfboard bags, too. 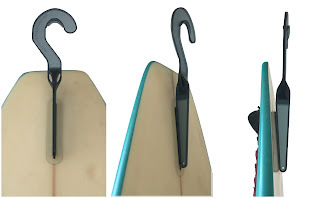 The Surfboard Hanger hangs surfboards similar to the way a clothes hanger does. The Hanger itself hooks around and hangs from a horizontal pole. The Surfboard Hanger then secures to your surfboard in the center fin box, so your surfboard hangs vertically, nose down. Of course there are all types of surfboards, including different fin box setups - the Surfboard Hanger was made with all surfboards in mind. 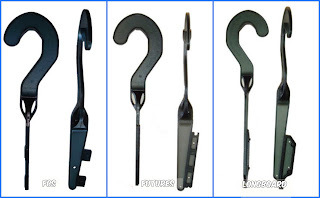 The Hanger comes in 3 options to accommodate your fin system - FCS, Futures, or Longboard. For strength, the Surfboard Hanger has been built to hang surfboards of all sizes and weights and can support approximately 50 pounds.